I work in an impoverished community where sports are very important. To some, it is the only thing that is important to them. Learning may not be a high priority regardless of all the tricks teachers and school leaders have tried to pull out, but sports have a special magic for our students. They see African American athletes playing for NBA titles or hitting a grand slam in a baseball game, and my students want to be those athletes. 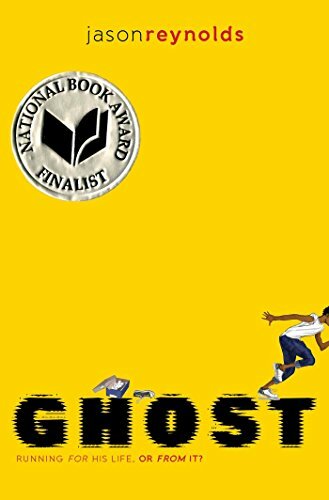 Too often books are jaded with primarily white characters and my students struggle imagining themselves in those books, but that was not the case in Ghost. The main character, who self imposed the name Ghost, has a lot of powerful messages behind himself that sat and made me wonder. Initially, I was expecting the young man wanting to hide from something or be invisible like a ghost, but you offered so much more that parallels to many of my students. This young man lives in the heart of many of my students. He fought for daily survival and held with him an embarrassment of his own situation because he continually compared himself to some of the other privileged students around him. We try not to compare, but it is hard sometimes not to. The negative feelings from comparing to others can lead any child into some form of an altercation, whether its physical or verbal. Ghost’s daily grind of only having one parent around and an aunt who loves him is echoed around me. His mother cannot provide everything he wants or might need to be as successful as his peers, which he has learned to go without which is a burden. Ghost walks around guarded and not wanting to share about his home life and his father’s whereabouts to everyone, even his coach. My students shrug off the same obstacles because they struggle handling the harsh truths about their own family; like Ghost, they know where there loved one might be and cannot shake the uneasiness it causes them inside. Sometimes it’s easier to lock up their emotions inside than face the mortification that comes with someone else knowing ‘it’ about them. It’s hard for a middle schooler to open up and face the trauma from violence publicly, especially to me–a white teacher. I often get phrases like I wouldn’t understand or I’m too white to get it. To avoid it, students crack jokes to laugh at the struggles to avoid crying about the struggles. I try to snap back sometimes, not to crush their spirit, but to build dialogue and camaraderie with the student. Being a track based novel, Ghost’s story is built around running for his new team, but he is running from so much more in his life. It took a male role model to show him some tough love and flexibility when he needed it most. I hope I can be that person for my students who face similar races in life growing up while they’re in middle school with me. There are often mistakes by kids, but that is OK as failure is the first step in learning. I see Ghost’s story as a platform to begin some tough conversations with kids and build a solid teacher-student relationship. The hidden messages and themes throughout the novel are ones my students can relate because there are numerous Ghosts walking around my school that need a coach in their life. Thank you, Jason, for giving me a platform for reaching students where they can see themselves in a book. This entry was posted in Instruction, Secondary Education, Students, YA Books and tagged Book Review, ILA, instruction, Jason Reynolds. Bookmark the permalink.